For anyone wearing tunnel jewelry rubber o rings are a definite must have. 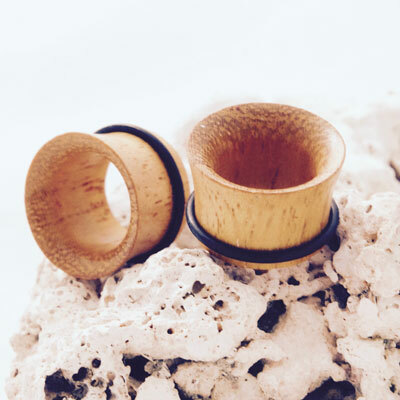 These make sure that your flesh tunnels, plugs, tapers and expanders will perfectly fit into your ear lobe piercing and won´t drop out. The material can be stretched easily and can therefore be put in very comfortably. If you have lost one or more of your rubber o rings or if it is teared apart you can find new rings here. They are available in the colours white, black and transparent. The size mentioned in the description is the inner diameter of the rubber o ring. This basically is the size of your stretched ear lobe piercing. Rubber or rings are also used for single flared tunnels. These are tunnels where one side is curved out while the other is not so that the tunnel jewelry cann be put into the ear lobe piercing and afterwards can be fixed with the rubber ring. We offer a large selection of different rubber sizes. Just select your personal one and chose from the different colours and your piercing jewelry will have secure grip again.